Much of Joan’s story and work that director Susan Woodfine presents in Living on the Edge uses a major natural disaster along the St. Lawrence River in Quebec that devastated communities in 2010. There’s nothing inherently natural, though, about such violent waters in these picturesque coastal communities, and Joan’s lens captures the landscape in all its natural wonder and menace. 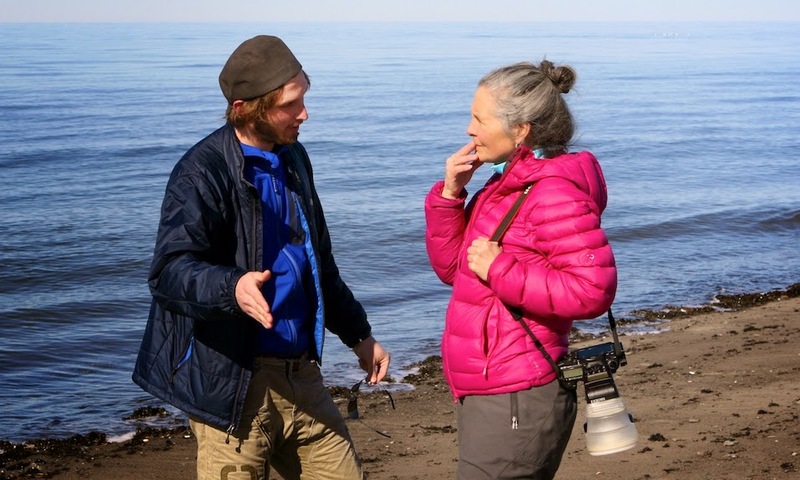 Harnessing the negative effects of climate change is a little too obvious, however, so Joan turns her camera on a different angle and takes snapshots of the things people are doing to be proactive about the environment. The film shows that it’s much more practical to direct the conversation on climate towards acknowledging and celebrating things that individuals, collectives, and companies are currently doing to encourage sustainable living. Talk about the benefits of wind energy, say, instead of regurgitating the drawbacks of fossil fuels. The wake-up call came years ago (for some), and the next step is putting ideology into practice. Living on the Edge also finds a greater story behind Joan’s photographs, for it weaves between her work as a photographer and the effort she puts into maintaining a farm with her husband. The film demonstrates how art and activism go hand-in-hand as Joan works long hours with her husband to make a living through the same work ethic and ecologically friendly philosophy that Joan puts into her photographs. It’s hard work, making a sustainable farm, and Living on the Edge lets several voices from Joan’s community explain how the green shift ultimately calls for a greater change in ideology that moves away from cheap conveniences available year-round to accepting costlier regional diets that keep everything in balance and offer significantly greater long term benefits. The farm work is exhausting, though, and it’s impressive to see Joan and her peers show such commitment to a cause in which they believe. Woodfine takes audiences from sea level and up high, high, high in the air as Joan photographs the beautiful sunsets from the vantage points of wind turbines in her community. These photos are inspiring in their visual power, especially for the filter of hope that comes with her activist photography. One particularly great sequence takes the horizon of the St. Lawrence that one sees from a bridge and uses it as a screen onto which the filmmakers transpose some of Joan’s most arresting images. The striking montage of still frames creates positive emotions, which should ultimately encourage audiences to take their own step towards protecting the environment. Living on the Edge screens at Planet in Focus on Saturday, Nov. 8 at 11:00 am at Nat Taylor Theatre, York University (Steeles/Keele). Director Susan Woodfine will attend for a Q&A.